Follow Up Current - Shows prospects with follow up dates today or later in increasing order (i.e. today, tomorrow, etc..). Status, tag and program filters are available. Status summary at the top of the page shows the current number of prospects by status. Follow Up Late - Shows prospects with follow up dates which have been missed in decreasing order (i.e. yesterday, 2 days ago etc..). Status and Tag filters are available. Status summary at the top of the page shows the current number of prospects by status. Performance - This is a new view which displays the status updates of all prospects along with success rates for each status. The status summary also displays the number of prospects lost and rejected. In this view you will also see all the status changes for each prospect. Location, Recruiter and Program filter are available. Applying filters will automatically apply them to the statistics summary. All - All filters and options are available. Filters include Location, Recruiter, Status, Tag, Program, Group, Follow Up From/To and Expected Date From/To and can be ordered by various columns. To give users some of the flexibility when moving into fixed stati each prospect can now be tagged. The tags can be customized under Configuration->Prospects and can be selected when editing a Prospect Profile. Tags stay with the prospect throughout the entire workflow and can be used to organize and / or manage prospects. When you setup an interview or application for a prospect you can now set it as 'In Person' or 'By Telephone'. Applications also have a third option for applicants who need to be sent applications or fill them out online. Lastly you can automatically have the status added as completed. When not in Performance view, the right most box in the top of the screen will display the overall statistics for the current user. 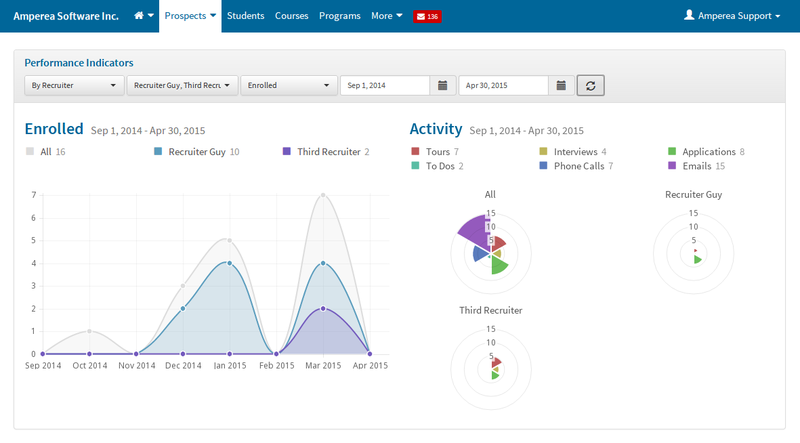 These include the user's current Tour, Interview, Application and Enrollment rates. Overall statistics for the current user now appear in the status bar. When you click on the Prospect menu at the top of the page there is now an option for 'Performance Indicators'. These indicators display recruiter performance in a graphical format. On the left hand side is a view of success rates over a selected time period. On the right hand side is a breakdown of all activities in that same time period. The indicators can be broken down by recruiter, location, status type and date range. The ability to export this information into a report will be made available within the next week. The left hand chart show a comparison of students enrolled bt two recruiters. The right hand side shows a breakdown of activities for each recruiter. If you have any comments, questions or concerns please email us at support@ampeducator.com.